There are few cities in the Southeast quite as ‘gramable as Charleston, South Carolina. Turn and snap in any direction and you’ll have yourself a lovely photo. Beyond the beauty, the city is steeped in culture and it’s to-do list is lengthy. 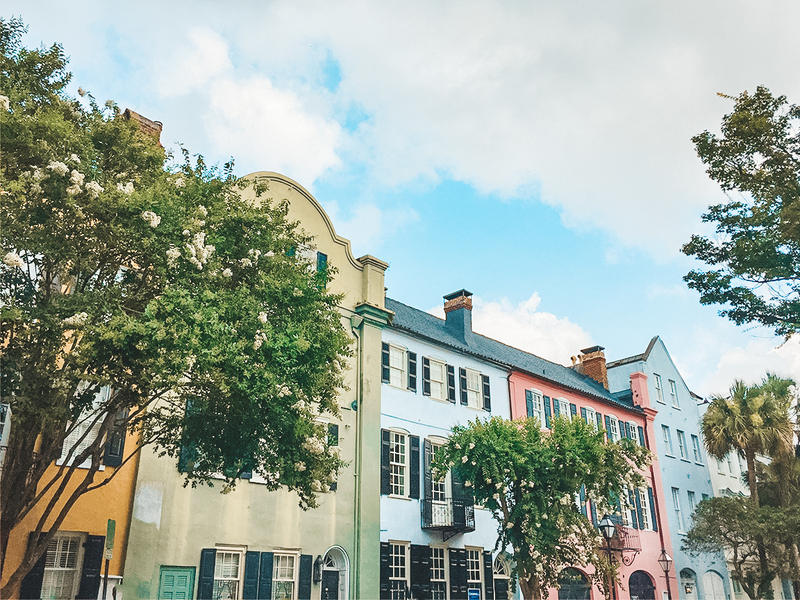 Charleston has so much to offer: history, low country cuisine, beaches, a booming nightlife, local artisans, and more! 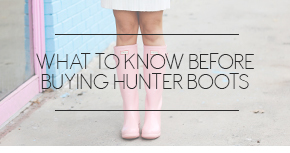 I have done a few weekend round-ups encompassing these things HERE and HERE. While I am there soaking in the culture, I make sure to stop by my tried and true spots to snap some photos. 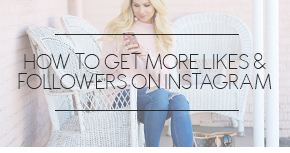 So I thought I would round up these locations and share them with all you feed-savvy ‘grammers! Let’s begin with the obvious: Rainbow Row. 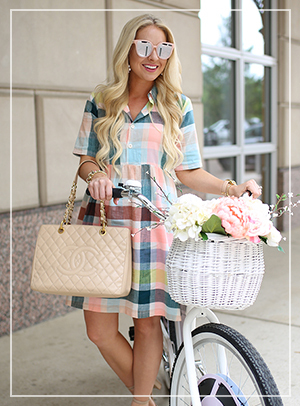 You could get endless photos here because every home is bright, colorful, and unique. What’s remarkable is that even though on any given day there are a ton of photographers here, there is such a wide array of backdrops that you’ll have plenty of space to shoot. Pro Tip: These homes face East so if your shooting portraits, be sure to shoot mid to late in the afternoon. This now closed Carribean restaurant, The Americano has quickly become a hot spot for photographers. The colorful, retro building facade is so fun, you’ll be shocked the restaurant couldn’t stay in business. Here’s hoping someone restores this establishment back to it’s glory, but in the meantime – we’ll take the opportunity to get our dream photoshoots in. Pro Tip: The sun rises behind this restaurant, so for your best photos – be sure to shoot here in the morning. There are a ton of public beach access boardwalks on Sullivan’s Island, but my favorite is the one by the lighthouse. 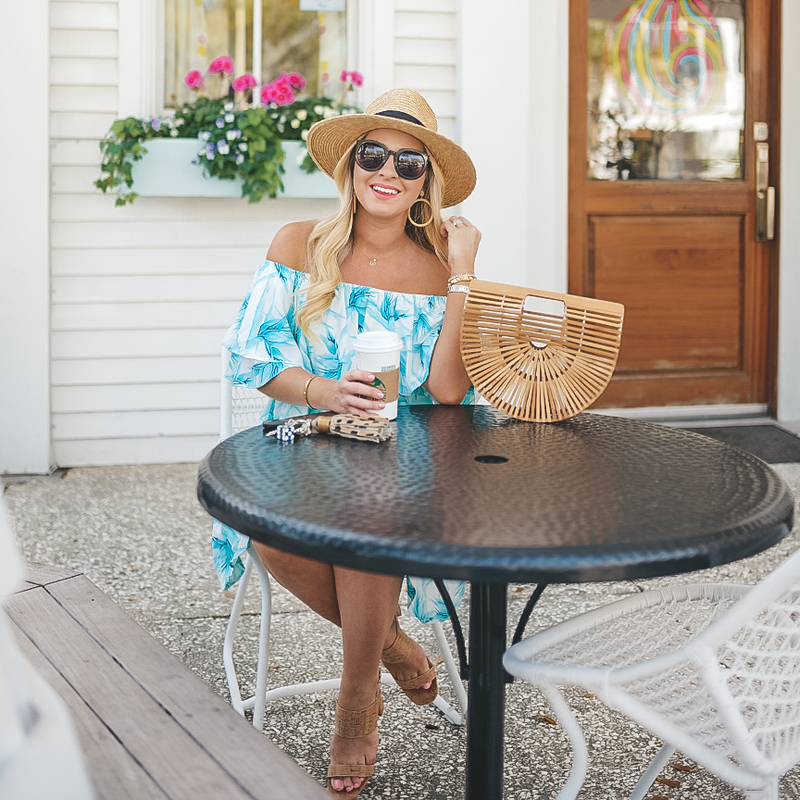 Compared to Folly Beach and Isle of Palms, Sullivan’s Island is far less commercialized and, as such, has less people making it the perfect spot for shooting your beachy looks. Pro Tip: Shoot here in the morning. If it’s a bright, sunny day, there is nothing to keep your subject in shadow so you’ll want the light to be behind you. From late March to early April, gorgeous wisteria blooms down the fence of one of Charleston’s historic homes. Not only does it make for a gorgeous Spring backdrop, but it smells AMAZING! Pro Tip: This fence faces west, so be sure to shoot here in the morning. 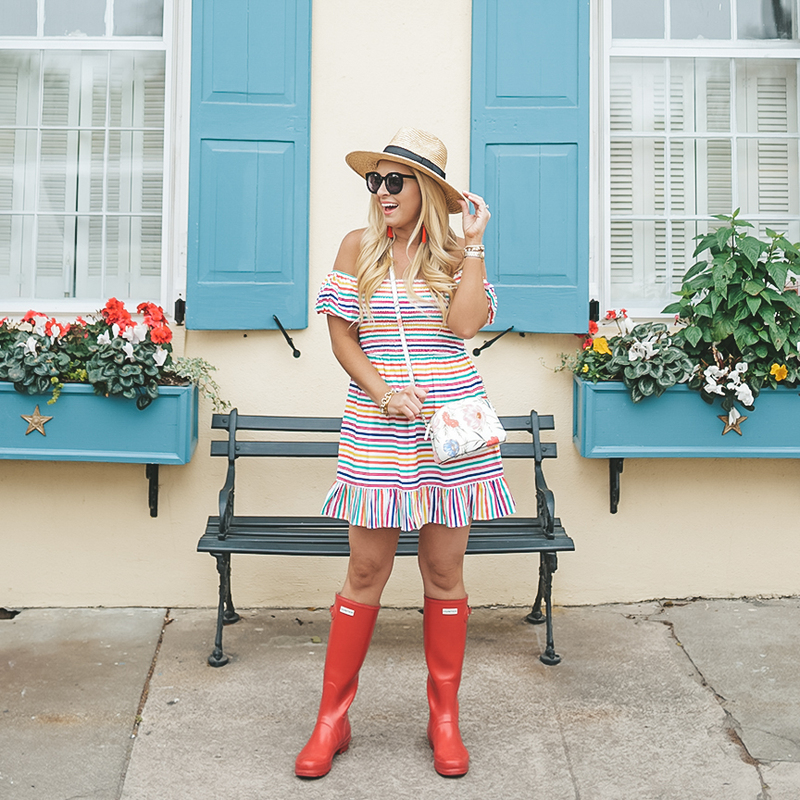 If you have been to Charleston, you have either oohed and ahhed at the Mills House or maybe even had the luxury of staying there! Nothing screams perfect backdrop like a huge pink building lined with palm trees. 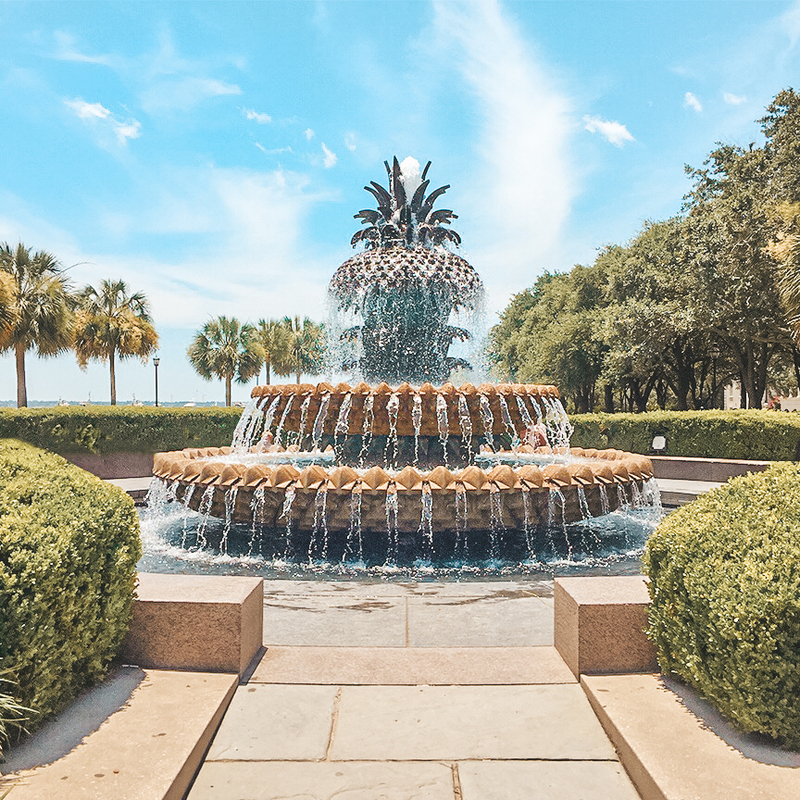 Charleston features a ton of gorgeous public parks, but the most popular of which might be Waterfront Park thanks to its famous pineapple water fountain. This fountain is quintessential Charleston and the pineapple motif, which stands for hospitality, is reflected throughout the Holy City. Pro Tip: Be sure to get here very early in the morning to shoot the famous water fountain because this park gets very crowded and kids tend to play/swim in the fountain in the warmer months. 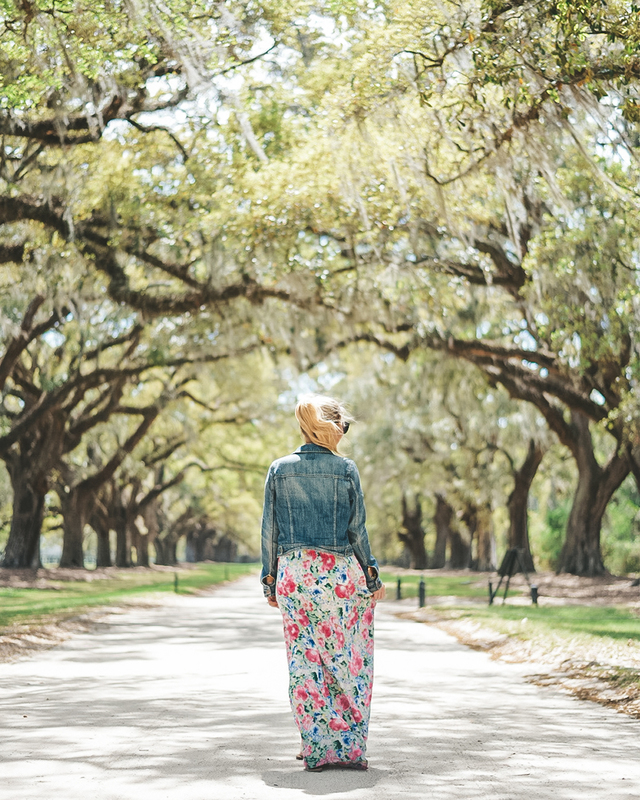 Otherwise referred to as America’s Most Photographed Plantation, Boone Hall is a must-see for photographers and history buffs alike! The entrance features two jaw-dropping rows of living oaks that were planted in 1743 by the son of Major John Boone himself. It took 200 years for the oaks to grow to meet overhead and the result is seriously stunning. Pro Tip: There are gorgeous living oaks behind the plantation over the water that are amazing to shoot at, as well! 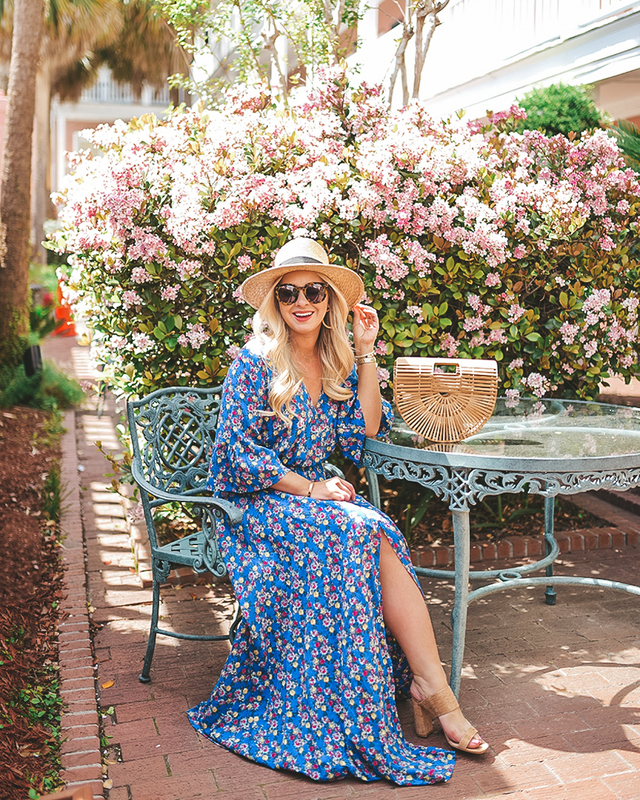 Nestled in the heart of Charleston, the Meeting Street Inn is a staple hotel made popular by its location and lush courtyard. 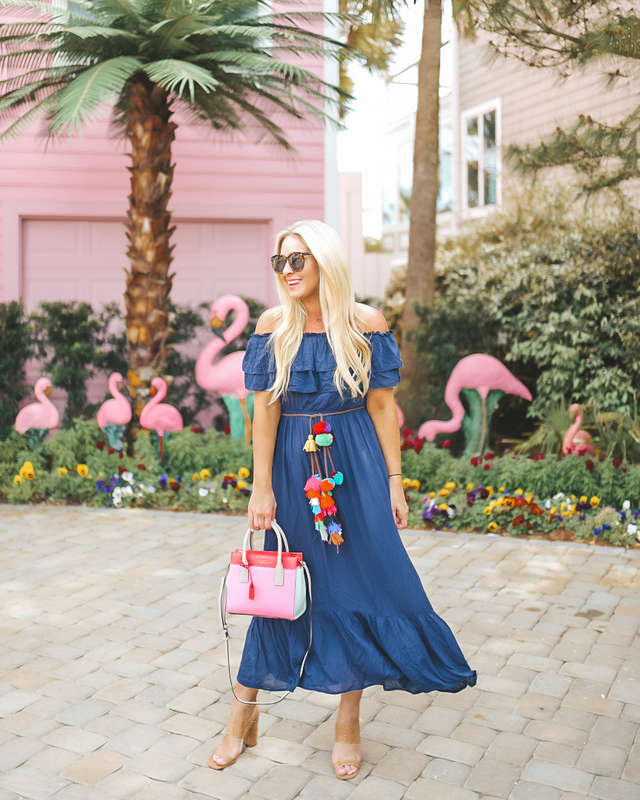 Even if you aren’t a guest, you can pop off Meeting Street and into the courtyard where gorgeous blooms, intricate water fountains, and palm trees abound. No trip to Sullivan’s Island is complete without a stop by Obstinate Daughter. The outdoor eating area features some of my favorite flower boxes in all of Charleston. Plus, it has all the perks of Charleston’s famous low country cuisine without all the crowds of the city. Pro Tip: Eat here! (haha!) But seriously, head upstairs into the restaurant because the interior decor is to die for. When exploring Isle of Palms, I always stop to admire this adorable rental home. The house itself is bubblegum pink and there are flamingos COVERING the yard! And while for a cool $2K a night it can be yours to rent, I prefer to stop by and snap a few pictures instead. If you have any additional shooting spots in Charleston, feel free to share them in the comments below! Happy shooting, y’all! Pin the image below to bookmark this page! These are so amazing! 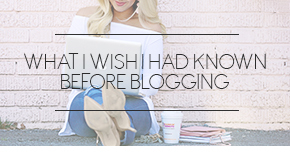 As a new blogger, this will be really helpful! Thank you so much for sharing!